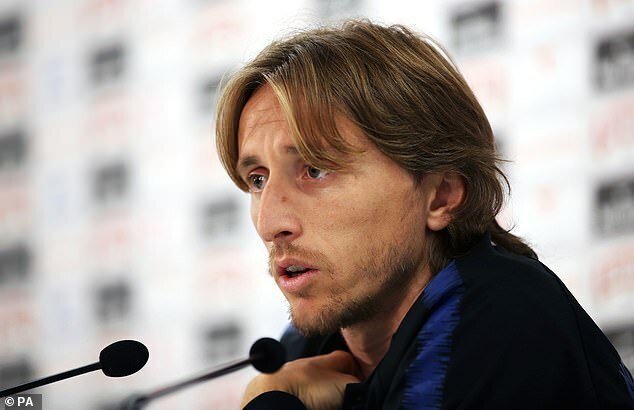 Luka Modric has warned England to prepare for a backlash as he revealed Croatia’s players still feel resentful about how they were perceived at the World Cup. With England back in the firing line, Modric is anxious for Zlatko Dalic’s side to reassert their superiority. ‘We felt a bit disrespected, not appreciated as much as we deserve,’ said Modric, who stressed his comments were not aimed at Gareth Southgate or England’s players. ‘It was extra motivation for our team, even in a World Cup semi-final when you don’t need extra motivation. ‘That’s how we felt. That’s how I felt. Is that a problem for England? That’s something you have to answer yourself and analyse. ‘We want to feel better about ourselves (after losing so heavily to Spain). We’ll see if England are better than during the World Cup. Modric was crowned the world’s best player on the back of his magical performances in Russia. ‘If you look at the number of goals he has scored for Tottenham,’ said Modric. ‘He has took them into the Premier League title race, which isn’t easy because other clubs are investing more money, then he’s proved himself one of the world’s best forwards already.